Pretty Pink Posh November Product Blog Hop! Hello! Welcome to Pretty Pink Posh November release blog hop! I am excited and been waiting for this day to share with you Pretty Pink Posh’s new stamp set and dies. Yes, Paulina is releasing stamp set and coordinating dies. Yay! Very exciting and a huge congratulations to Paulina for her new adventure. For this hop, you should have arrived from Shannon McComb‘s blog. If this your first hop, then don’t worry, I will list the participants of this hop towards the end of the post. Make sure you visit all the blogs and comment. There are two giveaways. The details of that is also at the end of the post. I have a few cards to share. So make yourself a cuppa and enjoy! First up are two cards using Winter Friends Stamp Set, Winter Friends coordinating dies and Photo Frames die set. I love the Photo Frames die set. They are perfect size to go on the card front either as a cluster or just one. I decided to cluster in three. I choose the large Photo Frame and the two smallest ones. The cute images of dog, cat and penguin from Winter Friends stamp set is designed to peek out of the other elements in the stamp set such as the stockings and coffee. I decided to use the photo frames instead. I stamped, copic coloured, die cut and brush the images with Wink of Stella. On a white card base, I sponged Spun Sugar and Cracked Pistachio distress inks. Then randomly stamped the music notes from the stamp set in black ink. I then adhered the photo frames die cut using foam adhesives overlapping the smaller frames slightly over the large one. Then I adhered the coloured die cut images from the Winter Friends stamp set again using foam adhesives. Stamped the sentiment from the same stamp set on a strip of cardstock sponged with Spun Sugar distress ink. Finally embellished with Classic Christmas sequins mix. Here is a closeup. On my second card, I use the baubles from the Winter Friends stamp set and photo frames dies. For this card, I stamped copic coloured and die cut the baubles from Winter Friends Stamp Set. Then I die cut the large photo frame with gold glitter cardstock, the smaller photo frames using white cardstock. On a white card panel, I sponged some Seedless Preserve and Mermaid Lagoon distress inks to the centre of the panel. Then layered and glued the large photo frame over the two white photo frames. Added the inside of the large photo frame in white, then layered glued the baubles with bunched up thread under it. I stamped the greetings on a strip of white cardstock, trimmed an angled edge and adhered using foam. Embellished with Classic Christmas sequins from Pretty Pink Posh. The card base is brushed gold cardstock. Here is a closeup. I did some ink smooshing technique to make my background for this card. I wanted a watercolour wash look to the background. I used acetate sheet to smoosh Salty Ocean distress ink on my card front. This is not watercolour cardstock but Neenah Solar white. I added layers of ink by drying the ink layer in between. Then I flattened the cardfront by putting the card base between few cardstock packs. Then I set out to stamp, copic colour and die cut the umbrella and the handle. Die cut the smaller scallop die using glitter gold cardstock, stamped the sentiment on white strip of cardstock. Then I went back to my card base which is now dry and flat. I stamped some raindrop using blue pigment ink. 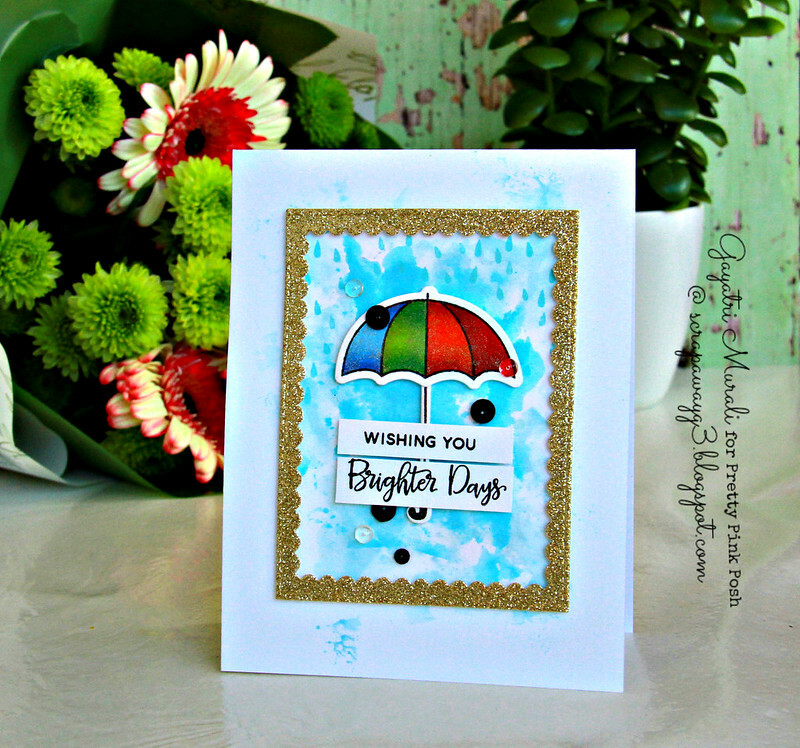 Since pigment ink sits on top of the cardstock, they add a tiny bit of dimension making the rain drops dimensional. I adhered the scallop frame using foam adhesives, similarly the umbrella in the middle, then the sentiments strips on the handle of the umbrella. I finally embellished the card with Clear Droplets and Onyx 4mm and 6mm sequins. Here is a closeup. Hope you like my cards using the new release stamp sets and dies from Pretty Pink Posh. You next stop in the hop is to Lexa Levana‘s blog. Here is the list of all the designers participating in the blog hop today. This is day #1 of the hop. There is one more blog hop tomorrow with a different set of designers. Make sure you hop and leave comments on all the blog. There are four $25 gift certificates up for grabs (two for each day!) Winner will be picked randomly along the blog hop. Comments to be left by 11:59PM PST on 11/16/2015. Winners will be announced on Pretty Pink Posh Blog on November 18th. Thank for stopping by today. Serious cuteness overload on your first two cards! The third: heart-warming! Wonderful showcases of Paulina's new products; the little frames and critters are outstanding! Beautiful cards.. I particularly like the second one! Great work/play! Your cards are amazing, as always! Thanks for all the PPP product inspiration!! all your cards are fabulous but I esp love theones with the golden glitter frame and baubles (ornaments) great job! These are all so fabulous and love the colors and designs! Pretty cards and the musical notes makes a great background! These are so fun! I can see lots of uses for these. Thanks for sharing your great examples. You've done it again. Lovely cards to showcase these new PPP products. 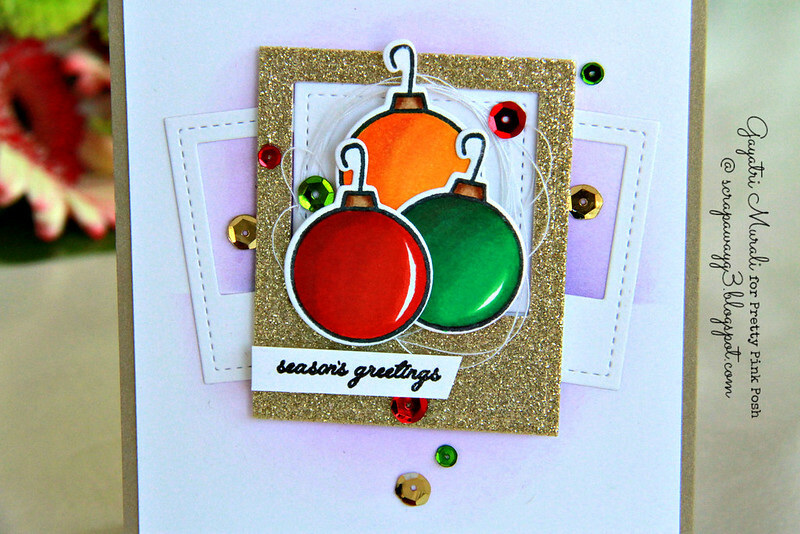 Love the depth of vpcolor on you baubles card! Thank you also for showing and explaining a new technique to me.. Shmushing! Gotta try it! Awesome cards! I love them all. Omg, these cards are fabulous! Thanks for enlarging the sets. Easier for me to see them. What cheerful, fun cards! Love them. The cards are sooooo cute! I love how you used the photo frame to ground your critters! Thank you for sharing these wonderful ideas. Wonderful cards showcasing PPP dies and stamps! Thanks for the inspiration. Great cards! Love your colors! So many pretty cards! Such cute stamps!!! Super cute!! I love the glitter frames!! Loving how you used the photo frames! Great sparkle too. Such lovely cards! Thanks for the inspiration! Wonderful cards! I love how you used the photo frames to ground your images. These new stamp and die sets are really cute. Thanks for sharing these awesome cards. Both cards are great. The ornament cards really caught my eye. good designs and especially like your use of the frames! The little critters are so perfect for the photo frame dies! Adorable cards. The 1st card with the musical notes just wants me to sing jingle bells. Great idea. The Christmas bulb card is beautiful. Thanks for sharing your talent. Really beautiful cards! Bright and cheerful! Wow fantastic cards made with the new products! As always.. your colouring is fantastic. Really like the traditional colours. Great cards! I especially like the music notes! Very nice. Magnificent! I love the pops of color as it really allows the products to be showcased! Three great cards and your coloring is beautiful. Gayatri, you are a true artist. I loved all of your cards. Beautiful cards!! Love how different they all look and love the bright colors! Great card ideas using the die cuts and stamps. Love the little critters peeking over the stitched frames. So cute! The Christmas bauble card is lovely with its golf glitter accent. Love the antlers on the penguin!! So cute! I can't decide which is my favorite. It's a toss up between the first and the third. i love the background coloring you've done on all of them, too! Darling cards. I love all of the little added touches to the animals. The umbrella card is bright and colorful. The photographer in me especially likes the Poloroid frames. Way too cute!! Nice stamps! These are so cute! The stitched photo frames are my fav for this release! I love these card So! The gold glitter paper is gorgeous! Now I need that photo frames set and the scallop frames set! Beautiful projects!! You are such a talented lady!!! Love your gorgeous cards!! Wow, a great set of fantastic cards! Beautiful! Oh I am loving each one of your cards!! All so different but oh so fabulous!! the stamps are seriously cute. what i need are the die sets. they are great. Beautiful coloring. Love the highlights on the ornaments and the vibrant colors. I love the rich colors you use. I think we see so many light colored cards that it's nice to see some deeper color choices. I love these cute little critters that can have dimension by hanging out of the pictures. Very cute! These are all fabulous, Gayatri! First, I want to give a THANK YOU to you for featuring such nice close-up pix of the new products used. I have VERY poor vision and I have a very difficult time seeing things on the computer, so I truly appreciate this extra kindness! And, third, I am really liking this new collection from PPP! The designs are fun and can be used in lots of ways! Super cute cards. Love the ornaments. Wow, you did an outstanding job creating these adorable cards with the new stamps and dies. Your colors are so nice and vibrant! Love your cards. The colors make me happy. I love all 3 of these cards! Such enormous talent you have! Love the baubles, too! Love all 3 cards that you made! !And I especially love the card with the music note background since I sing in a chorus. Great cards made! Love the little music notes! All three cards are very nice but i love the seasons greeting card particularly. Great job! Awesome cards!! That little guy in the stocking is so cute. The Christmas balls are so pretty!! These are all wonderful great job, love the music notes you used for the background too. Your coloring is amazing, awesome blog hop! Oh, MY, GOODNESS!!! ADORABLE!! Love the notes and animals! Your ornaments coloring is perfect! Love the rainbow umbrella!! !SO hard to choose a favorite!! wow… amazing set of cards!! That gold frame is so beautiful! So much fun! I love your coloring! I love the coloring on your fun cards! I love how you used Holiday Pals–the critters in the photo frames and the ornaments are adorable! Beautiful cards! I love the frame die! The animals seem to be anything you want to make them! So fun! Wonderful cards! I love the gold frames, really adds a festive touch! Cute little penguin in the stocking. And I love the rainbow umbrella! Beautiful cards! I love the variety of sizes for the Polaroid die, they definitely work well clustered together! And I really love how you cut he frame out of the gold glitter paper on the card with the ornaments! Fabulous cards! The brightly colored sequins were wonderful additions to all. Love the umbrella card background! It's great to have raindrops included with the stamps. Love these cards. Your coloring is so good! Also I love the backgrounds on the critter card and the rainy card. Cute cards, my favorite it the rainy day card. I love how you did the background and well I'm a huge gold and glitter fan, lol. Thanks for inspiring. Beatiful cards, loved that gold frame!! Great cards, love the bauble one. Fantastic cards! Those dies are so versatile and those critters are beyond adorable! TFS and inspiring! I really like your cards! Great colouring and smooshing, and I love the different ways you've used the frames. Adorable cards! Fabulous coloring! Can't wait to get the Scallop Frame dies! I especially love your second card. I love how you placed the sequins and how the photo frame looks in gold. The ornaments are beautiful. Love the new releases Especially like your backgrounds! I love those stamps, they are so adorable! 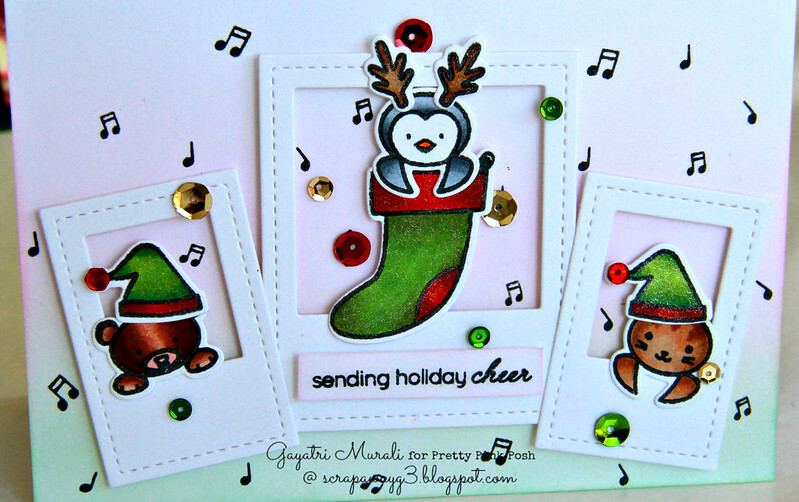 great card designs- those holiday pals are super cute! absolutely gorgeous cards…. loving those photo frames!! Love your cards…all beautiful. I like the first card with all three die cuts! Wow awesome love, love your cards as Always. That glitter, the design the awesome coloring and the vibrant colors. You rocked this release. Those cards are gorgeous! They show off the collection wonderfully! Three amazing cards! Love all of the gorgeous and glittery detail you added to them all! Thanks for sharing your ideas. So beautiful cards. WOW – there is a WORLD of WOW's in your cards today Gayatri!!! LOVE LOVE LOVE the FABULOUS design, AWESOME colouring, PRETTY layers and GLORIOUS SPARKLE on each and every one!!! Darling cards, G! I love your copic coloring too. I had to go back and look for the ornament stamp. I was so focused on the critters in each set, I never even saw it LOL Super cute and versatile sets from Paulina! You had so much fun playing with them. 😉 Thanks, Paulette S.
Since Google can't edit or delete my old Blogger profile from a blog moved to WP in 2012, with closed email address. And won't just post with my active email address on my Google acct. Another Epic fail…from Google. Beautiful cards. I want everything in this release! Your cards are so wonderful, thank you! Wow, beautiful cards. I really like the little music notes. I love the cards, they are beautiful! Super cute cards = love those photo frames. Cute cards. Love that you can purchase the dies. The coloring and the Wink of Stella are so pretty. Oh my goodness! So many awesome cards! I love all three of them! Love the backgrounds you made! I really like how you switched the glitter from the ornaments to the background! Love this release! Beautiful cards! Thanks! Cute, cute, cute! Love all these wonderful creations. Rainy Days needs a home at my house! Beautiful and adorable critters, amazing photo frames and scalloped frames – awesome release. Those soft colors paired with the brights are fabulous. Great cards. Very cute cards, love all the music notes! Love all the frames in this release. Your cards are so cute! These are all such beautiful cards! Wonderful die cut layers and I like the water color splash behind the umbrella. Well done. LOVE all your cards, so fun and adorable! The sequins and your coloring make these such stunning cards. Very cute cards! Thanks for sharing and inspiring! Great new release! Fun, fun cards! Thanks for the inspiration! Your cards are gorgeous but I love the critters the best! What an adorable stamp set! They are so cute! I love all three cards! I am a critter fan, so the first one is probably my favorite because of that, but I love how you showcased those beautiful ornaments in the second card, and the ink smoothing technique on the third card really made a lovely background for the umbrella. Thank you for sharing your talent with us and giving me even more inspiration for this new release from PPP! Fabulus display of cards Gayatri! Love them all, TFS! I love your cards. They are so gorgeous! Such fantastic cards! I love the first one with the photos of the critters, its so sweet. And also love the gold, glitter frame you created with the new frame die. Can't wait for my order to arrive!!!! Your cards are so cute and beautiful!! Wow, what awesome cards Gayatri! I love the background you created on the first two cards and the glitter panel in the third card really makes everything pop! I really love the way you used the frames In your firts 2 cards but all of the cards are very lovely. 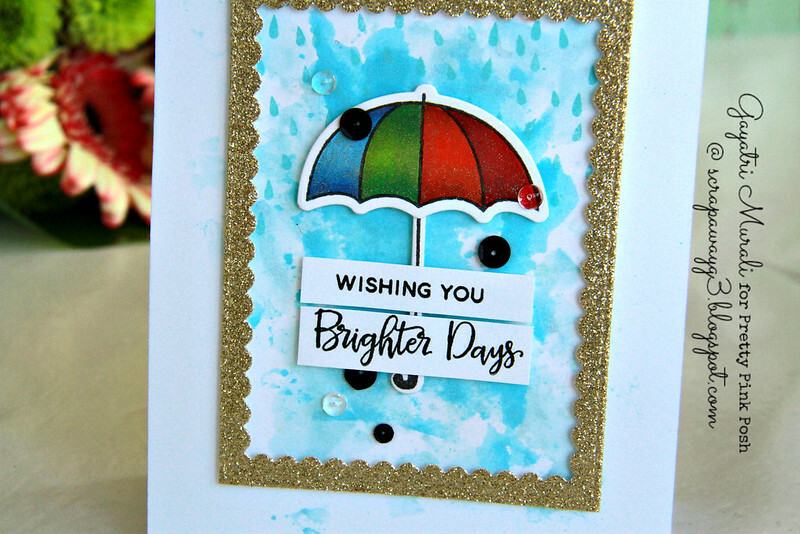 Those color fades are terrific and I love the smooshing mixed with raindrops!! Very cute!! Love the critters in the stockings. So cute! Awesome cards…love the photo frames. What cute cards! The critter card is super cute! Love the frame dies! Oh my, your coloring is magnificent. Those bright baubles are very pretty. Beautiful projects! Great cards love the coloring especially on the umbrella! Great cards & love the sparkle!! I love all your cards and especially those photo frame dies!